ALPHA SILVER is a tailor made highly effective solution for de-tarnishing of silver articles like silverware, cutlery giving it a fine lustrous look. 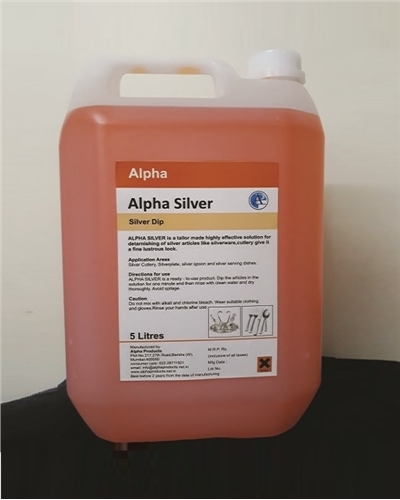 Alpha Silver a ready to use product. Dip the articles in the solution for one minute and then rinse with clean water and dry thoroughly. Avoid spillage. Silver Cutlery, Silver plate, silver spoon and silver serving dishes. Do no dip knives, blades more than 1 minute to avoid corrosion. Do not mix with alkali and chlorine bleach. Wear gloves. Rinse your hands after use. In case of contact with eyes, wash with plenty of water and seek medical attention. Store in a cool and dry place. Best before 1 year from the date of manufacture.